Ove explained that once 9/11 happened and military operations changed dramatically, the maintainers assigned to care for the aircraft in the airpark were pulled, leaving maintenance and care to be contracted out. Because of the required maintenance for the aircraft in Tampa Bay’s salty environment, the KB-50 will be transferring to the Air Mobility Command Museum at Dover Air Force Base, Delaware, the only Air Force field museum dedicated to preserving airlift and air refueling heritage. “The AMCM is unquestionably the single most appropriate location for this historic aircraft,” said John Taylor, the director of the AMCM. 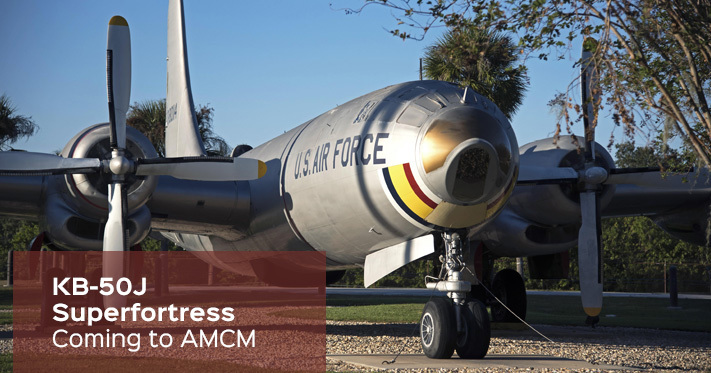 “We already have identified a preliminary display position, placing this historic aircraft in line with the two other AMCM tankers, a KC-97 Stratofreighter and a KC-135 Stratotanker. In a community that celebrates more than 75 years of partnership, there has been a large amount of shared interest in relocating this aircraft to AMCM. AMCM is ideally suited to maintain this aircraft as they have technical experts to support heritage operations. This transition to AMCM also allows the aircraft to be admired by hundreds of thousands of people annually. Decommissioning of the park is scheduled to begin in early December starting with the KB-50. While the first air craft is being dismantled, the F-16 will begin disassembly shortly after. The Arizona Air National Guard headquarters in Phoenix will become its new home. As the air park is clearing out, wing leadership is taking this opportunity to expand on the vision of the existing Memorial Park, building it into a comprehensive community park that will host a broader and more historically accurate heritage display while also focusing on low maintenance and cost sustainability. There are plans to replace the current static display aircraft with weatherproof displays of miniature models of the eight most impactful aircraft flown at MacDill. The park is also planned to house a covered pavilion that will be a central location for future ceremonies and base events. While plans are still being refined, it is estimated that the community park will be completed by Summer of 2018.